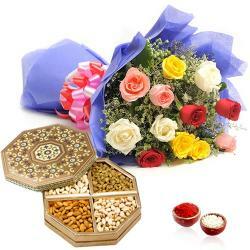 Product Consists : Glass Vase arrangement of 16 Pink Flowers, 500 Gms Rasgulla along with Free Roli Chawal. Sweets is the centre piece of every celebration accordingly for the special celebrations, gifts also need to be beautiful. 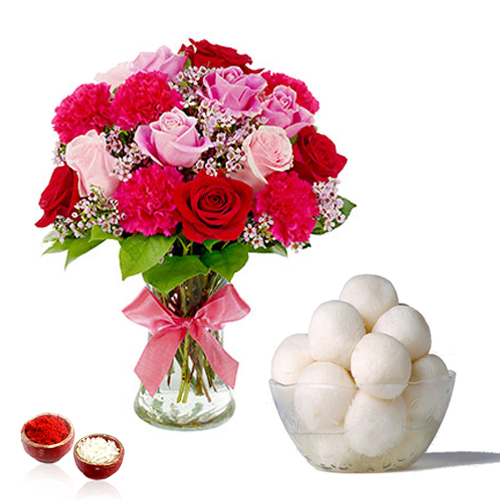 One of the very delightful hampers is this, which comprises of a Flower vase arrangement clubbed with even more luscious sweets called Rasgulla. Rasgulla is a delicacy from Bengal. Spongy white balls are dipped in to sugary syrup that enchases the taste and creates a delightful look. 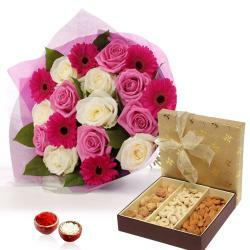 All this is topped with ravishing Pink shades Roses and Carnation arrangement and Roli Chawal making it perfect to be gifted on special festivals like Bhaidooj. 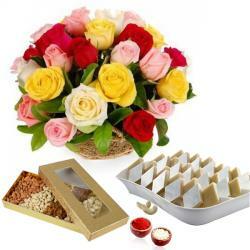 Product Consists : Glass Vase arrangement of 16 Pink Flowers, 500 Gms Rasgulla and Free Roli Chawal.